Published July 24, 2014 By Anna T. This post may contain affiliate links. Regardless, I only recommend sites I've researched and/or used and trust. 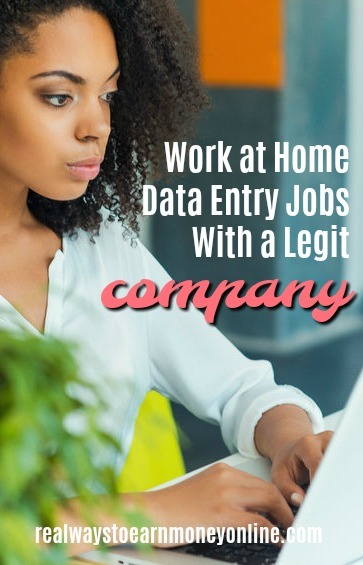 Most data entry jobs from home are either scams or they pay so little they're barely worth bothering with. The Great American Opportunities data entry job is one exception. It's completely legitimate work offered by a very reputable, respected company and the pay is very fair. However, nothing is completely perfect and there are a few drawbacks. First of all, this is seasonal work from home so you can't depend on it year-round. Also if you do manage to get in, you'll be put on a waiting list to actually start working. Depending on Great American's current demand for workers, you could be on the list for as long as one to five years. Great American Opportunities only hires people in the US for their data entry work. You've probably heard of them. They are a major company that does fundraising campaigns for schools and various organizations. You are basically just looking at scanned magazine order forms where people have written their names and addresses out by hand, and then keying that info into another form. You are paid a certain amount per form. The company has a few different types of forms you work from. On average, you'll receive around .10 to .14 cents per form just depending on what type of form you are working from. Your rate per hour is entirely dependent on how fast you can go. Many people who do this are able to average $9 an hour or more. Great American Opportunities pays weekly with direct deposit. You are working as an independent contractor. You can work any time you want, but there won't always be work to do. You just have to log in each morning and check to see if any forms have been scanned so you can start keying. The people who scan the forms generally work Monday through Friday although there is occasionally Saturday work, too. As mentioned above, this is seasonal work. Most of their workers begin keying forms in late September. The work stops on the last day of December. They do have work in the spring as well, but it's limited and they only invite certain workers to do it. You need a reliable, Windows-based computer and high-speed internet. There is a program you have to download to do the work, and if you're hired they will send you the link to that before you actually start working. You have to take their data entry test, which is pretty much just a simulation of the work you will be doing. This is a fairly challenging test because you have to maintain speed and good accuracy. Lots of people who attempt the test fail it — many of those people are good typists, too. If you don't make it in, they do let you re-test, but you have to wait a full year. You are only allowed to re-test once. This is a very sought after work from home job. Current and former workers have good things to say overall. The pay is decent for this type of work and the fact it's available in the fall/winter months means it's a great way to get money together for the holidays. If you're interested, you have to send them an email letting them know. They typically only do testing for the data entry in January and June of each year. I used to tell people to email them in early January or early June, but a few times in the past that turned out to be too late, so for now, I just recommend emailing them at any time so you can find out for sure when they do the testing since the specific dates vary. Great American does not post this job on their website so you will not be able to apply through there. The email to use when it's time to contact them is TOhair (at) gafundraising (dot) com. You will need to include your full name, address, and phone number in your initial email to their company. UPDATE 8/26/18 – A reader just informed me that emails to the address listed above are bouncing back. I'm not sure if it's because the inbox is full since they aren't actively hiring right now, or if that email is no longer in use. I've tried to find an alternate email but have been unable to do so. UPDATE 12/14/18 – This email address is apparently still bouncing back. If someone knows the correct email address to use now, please contact me to let me know! Thanks! If you don't feel like waiting a year or two to work for GAO, I recommend keeping tabs on sites like FlexJobs and Indeed for data entry listings. FlexJobs is a fee-based job search board, but they guarantee no scams are ever posted, and I've never seen any. Indeed is a free job search board, but you may occasionally find scams there. Just use “data entry” as your search term in the keyword box and keep an eye out for work at home job opportunities. A tip for those of you who were given an application date and applied on that date, only to be told you were too late: your best bet is to apply at midnight on the date given since they take only the first 200 or so applicants and, as mentioned, the job is in great demand. For instance, if you are given a 1 June application date, send your email at 12:00 or 12:01 midnight on 31 May–the “morning” of 1 June. I’ve been lucky enough to get this job for last 4 years, but their volume has decreased tremendously. I spend more time waiting on work to be scanned than actually keying and making money. It was easy to make money the 1st two years, now it’s a struggle. Think they’re hiring too many people and leaving very little for veteran keyers. Not worth the time anymore. I was just added to a wait list. They said I keyed at a rate of 73 order forms per hour with perfect accuracy on the test. That’s gotta be good right? Anyways, they said there are only two spots that will get contracts offered and they will be the two fastest/most accurate. Here’s to hoping I’m one of those two! I just took the test last night, so I’m hoping I did alright. I think I was accurate, but maybe not very fast. This is a joke, I applied on 5/31/16 and received and email to apply on 6/1/16 (today). I applied today and just received an email saying that all spots were full. hey guys i want to update u all I took the test again in July 2015 and passed the test! I am on the waiting list I hope I can get on with this company this year or next year. I just read all the information about this job but there is no actual email address to get in contact with anyone. Can you please post the actual site for this particular opportunity. Hi Angela, it is included there under the “Application Instructions” sub-heading. It reads: Great American does not post this job on their website so you will not be able to apply through there. The email to use when it’s time to contact them is TOhair (at) gafundraising (dot) com. You will need to include your full name, address, and phone number in your initial email to their company. So you can’t apply on their website, you have to email tohair (at) gafundraising (dot) com to find out when you can take the test. Hopefully it will be soon! I was on the wait list for 4 years. This company is not a scam. They are worth the wait and it should be obvious that when a work-at-home opportunity has such a huge wait list, that it is worth it, highly sought after, and NOT a scam! duh! Yes, definitely not a scam. This is hands down the best work at home job I ever had before I started blogging full-time. I received an email today that there is a spot for me! I took the test in January of 2014 and it is now July 2015. I am very excited! The waiting list is a joke. I apply in December 2014. Then they told me apply on January 5th. When I applied January 5, 2015 they said it too late and try July 2014 to apply. At this point, I am done applying for them. Messages come back as auto responses. Haha, I’ve been on the waiting list for 2.5 years. I sent an email the other day just to see if I would get a response. I did and it said the had already scheduled all their Fall tests and I was too late. The email suggested I try back in early January. It’s hard to say for sure because it will depend on how much work they have. The first year I did it (2012) they had a lot of work and it was easy for me to make between $100 and $200 every week if I wanted to and put in the time. But then the next year they weren’t as busy. I probably still could have made that much, but I was a lot busier with this blog so I didn’t do it as often. You can log on and off and work when you want to, but the work usually doesn’t start until around lunchtime and then most days it disappears by five or six pm. Thanks for the information. I had heard about this company earlier and got on the wait list this year. I am curious if you can speak to the frequency of the work once you do get a contract (approximate number of forms available, number of days per week, etc.). I am just looking for a general idea of the amount of work I might expect. Where do I sign up to take the test for GAO? You have to email them, the email address is listed at the bottom of the above post. However, they only do the testing a few times a year and won’t be doing it again until January 2015 most likely. I applied to this company however I did not have a good experience with them. I wouldn’t recommend them. I know many others sing the praises of this company and I was happy for them but there are some of us that had less than stellar experiences. Communication with them was also less than amicable unfortunately. I am really confused. The work stops on the last day of December but yet I can not email them until a couple weeks before then? If I want to work Sept-Dec, shouldn’t I be emailing them NOW? There is no way you would get in to work for this September. The people that are accepted get put on a waiting list to do the work, sometimes as long as five years but usually not quite that much. I took the test in summer of 2011 and was not invited to start working until fall of 2012, I did not get to start in 2011. It’s because this is such a popular WAH job, they always get tons of applicants. So if you emailed now, they’d just tell you to contact them back in late Dec. or early Jan. for their January 2015 testing round. They only test twice yearly and the testing is all up for this year unfortunately and they already have all the workers they need for this fall. Gotcha. Thanks for clarifying. I will have to apply in December!